Advertising is something every company or organisation needs to actively do to survive. To promote itself, to be known and to grow. This is no different for the funeral industry, funeral homes must advertise themselves to grow their business. Funeral homes who do not promote are destined to fade away. While this is usually rather easy it becomes tricky for the funeral industry. The funeral home has to find the thin balance between appropriate promotion and inappropriate promotion. A funeral home has to think long and hard about how, where, why and what it is promotion. This is because of the various attitudes bound up regarding funeral and death. Quite often we are unable to separate the aspect of death from the funeral home. Death might not 'happen' in or because of the funeral home, but it might as well sleep there. The funeral director deals in death, not with but in, for many people. So people find the promotion of a funeral home sometimes inappropriate or insensitive. A lot of emotion is tied to death and the funeral home. As such we treat funerals with a great deal of delicacy, with reverence and discretion. Previously funeral homes would 'advertise' themselves directly with 'customers'. For example they would send a staff member to talk with people at nursing homes. The staff member might hold a talk on how to deal with loss, how to plan a funeral and so on. Or they might just talk with various people one on one. Over time this has died out so to speak. Funeral homes now look to mass advertising, as in call centers, radio and TV advertisements, bill boards and so on. In the last 10-15 years there has been a shift from direct or single marketing to mass marketing. As such there is a 'new' thing popping up, funeral ads. Sometimes these ads are not always appropriate and are rejected by society. The picture blow is a perfect example of an inappropriate funeral advertisement. It is even the inspiration for this post. An insensitive ad with a poor pun so bad it was featured on 'FailBlog' and titled "Appropriateness FAIL". Perhaps the most inappropriate funeral home ad. You can find some other interesting funeral home ads at the blog "Confessions of a Funeral Director" (which is a rather decent blog on the industry). The most notable one is the third one down, which I have re-posted just below. 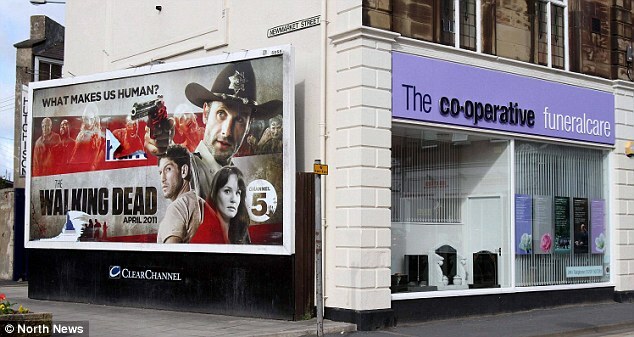 Basically an ad fot the TV show "Walking dead" was accidentally put up next to a funeral home in the UK. This made the news around the place and the ad was removed. Ad for 'Walking dead' next to funeral home. Advertising around a funeral home is just as sensitive as advertising for a funeral home. Advertising and funerals homes are quite a complex combination. Even when not related with each other they are associated with each other by society. Funeral home ads need to be careful about what they say and how they say it. They advertise a product which can directly upset people. The thought of a loved one's death, or even of death itself is not a good thing. Not something we appreciate. And funeral homes are liked heavily with death, we think not of a 'funeral home' but of a 'funeral' when thinking about this industry. The advertisements we accept are generally simple and to the point. They do not promote funerals but the funeral home. An example is the billboards for 'White Lady Funerals'. All they are is a picture of a woman smelling a flower and the title of the funeral home followed by their slogan "a woman's understanding". Simple and to the point, all they do is get the company name out there, let people know what they do/sell and promote their image. In the radio advertisements for 'White Lady Funerals' they say the name a few times and that they are 'decrete', 'professional', 'ethical' and 'respectful'. There is little to no actual talk of funerals. In other words a funeral home advertisement aims to not sell their product (which is dealing with the dead). Instead it aims to sell the funeral home itself. As such there is an importance placed on the funeral home over the funeral. The funeral home survives off its' name, off its' image, so it needs to promote this image and name. This is also evident in the fact that funeral homes do not say how to contact them. Nor do they encourage people to find them. In most ads we see a phone number, email address, website, etc. But not funeral ads, they simply have three things; company name, company image and company slogan (prioritised in that order). Look at the 'White Lady Funerals' again, nothing on how or where to find them. The reason I refer to 'White Lady Funerals' so often is that they advertise the most of the funeral homes. Their ads pop up everywhere, they have more exposure than anyone else. But these ads are also effective, I remember how high ups at InvoCare commented on an increase in numbers with the 'White Lady Funerals' ads. The final reason is that 'White Lady Funerals' is such a modern funeral home in every way and perhaps the flagship company of InvoCare. I might just have to look at 'White Lady Funerals' in more depth in the future when I discuss modernity and the funeral industry. This is why at a funeral you can find the funeral home name on just about everything. Quite literally the company name and/or slogan will be anywhere and everywhere it can be without causing upset. They have the company name on the hearse. On umbrellas they hand out. Companies go as far as to hand out things with the name on it for mourners to take home. I remember at WNBull we had little bookmarks with the company name in big bold lettering on one side and a story about the company on the other. At my grandfathers funeral they handed out little silver cards with his picture and date of birth/death. On the back was the company name and slogan. Advertising and funeral homes is a complex and sensitive issue. Just like the way we see funeral homes, they are bound up in so many attitudes and perceptions. Either way, advertising is an interesting framework to look at the industry. Many people today choose cremation, but are not aware that a full range of service options is still available. As with a traditional funeral, cremation still allows for visitation and memorialization. they have the area’s only on-site cremation service, staffed by Licensed Professionals. our loved one never leaves their care unlike most other funeral homes..thanks to the Beinhauer Family Funeral Services they never let us down.